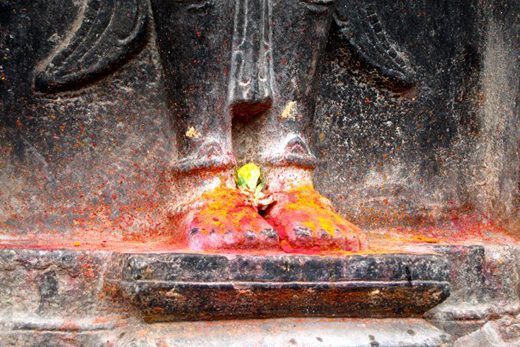 This #sacredmatters image was submitted by Anandi Salinas, one of the associate editors of Sacred Matters magazine; it shows the feet of Vishnu from the Srikurmam Temple in India. Sacred Matters, an e-zine at Emory University, is inviting readers to share images that are sacred to them. Sacred Matters, which serves as a forum for public scholars with a broad take on religion and culture, is asking readers to define their own concept of the term "sacred" by tagging their photos with #sacredmatters in their social media feeds, or emailing sacredmatters@emory.edu. The magazine is publishing the images on its website and through its social media accounts on Twitter and Instagram @SacredMatters and on Tumblr at sacredmatters.tumblr.com. "We want to see what is sacred to people in their everyday lives," says Sacred Matters co-editor Gary Laderman. The e-zine's call for submissions supports its premise that the sacred goes far beyond established religions. Among its goals "is to disrupt the lines between religion and culture, and identify how religion draws inspiration from culture." Laderman has been exploring the expanding and shifting concept of religion for some time. Sacred Matters the e-zine echoes the title of his 2009 book, which carries the provocative subtitle: "Celebrity Worship, Sexual Ecstasies, the Living Dead, and Other Signs of Religious Life in the United States." "There is more to religious life in America than belief in God, many more holy possibilities than what is offered in the so-called 'Great Religions of the Book,'" Laderman wrote in the book's introduction. His exploration of the sacred embraces realms ranging from film and music to celebrity and sports, from science and medicine to sexuality and death. For Laderman and his fellow scholars of Sacred Matters, it's all fair game. Got a great image that's sacred — to you? Sacred Matters invites you to share it.